(NaturalNews) Boxing might not be an activity someone with Parkinson's disease would consider to help improve their condition, however, it's just what Mike Quaglia is doing. Diagnosed with the disease at the age of 42, he became frustrated when medications didn't seem to be helping as much as he'd prefer. It's no surprise; the medication's side effects run the gamut from disturbingly vivid dreams and nausea to low blood pressure and chest pain. Shockingly, it's also been found that people taking such medications are also at a high risk for engaging in worrisome behaviors. For example, a Mayo Clinic study discovered that out of 267 Parkinson's patients, 66 of those taking a dopamine agonist, a Parkinson's-related medication, were involved in risky, excessive sexual activity or compulsive gambling. A focus that shifted away from iffy drugs and more on physical activity was a wise choice for Quaglia, who chose to fight the disease rather than let the disease take him down. Quite literally, he fought the condition, becoming involved with a group that focuses on teaching those with Parkinson's how to box. 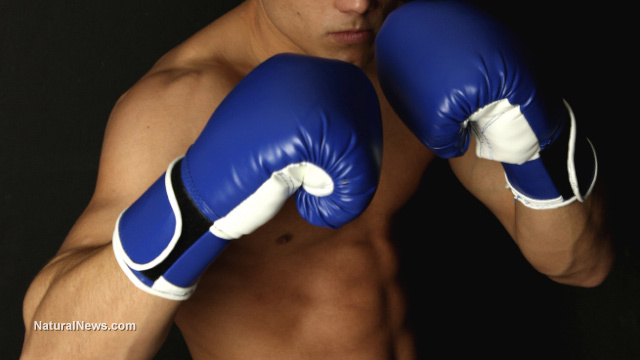 Furthermore, he's a regular at his gym where - you guessed it - he's found wearing the typical red boxing gloves. Quaglia says that on the days he boxes, he doesn't need to take his medication for six hours afterwards. This is significant because this time frame is twice as long as usual. Furthermore, his depression has diminished and he's more confident. Boxing "doesn't cure," he says, "but it helps." The link between physical activity and helping to improve Parkinson's symptoms is something that many people are starting to pay more attention to. A study conducted by researchers from the Oregon Research Institute, for example, found that compared to patients who just stretched, those who engaged in six months of tai chi twice per week had more movement control, improved balance and were less prone to falling. Falls are a common and sometimes life-threatening event in patients with Parkinson's disease. However, to our knowledge, no clinical trial has shown the efficacy of exercise in reducing falls in this population. Thus, this study adds to the behavior-based treatment literature by showing that tai chi can effectively reduce the incidence of falls in patients with Parkinson's disease. According to the National Parkinson Foundation, for "...people with PD exercise is not only healthy, but a vital component to maintaining balance, mobility and daily living activities." It's explained that Parkinson's patients who have enrolled in exercise programs lasting more than six months are more likely to show "significant gains in functional balance and mobility," compared to exercise programs that run for just a few weeks. Dr. Daniel Tarsy, director of the Parkinson's disease program at Beth Israel Deaconess Medical Center in Boston, says exercise is beneficial when it comes to helping these patients as their once rigid movements become more at ease. "I'm a believer," Tarsy says. "Patients look a lot different walking out an hour later than they did walking in. They literally have a bounce to their step."